There are visitors in the house right now – emissaries from my beloved church family at Newbury Baptist Church. Last week they stood tall in the church – testament to the love which brought them there, and arranged them so beautifully. Now they stand in the house, breaking up this grief-mist like shafts of sunlight through a dusty room. They had another function this time last week, too. Their role was to act as a visual backdrop to Evangeline Patterson’s poem ‘And that will be heaven’ – read out at the thanksgiving service. 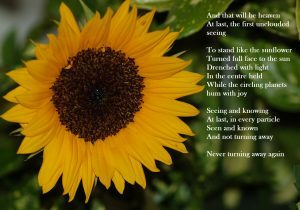 Below is a picture of one of my bright emissaries, and the poet’s words. Click the image to read the poem.